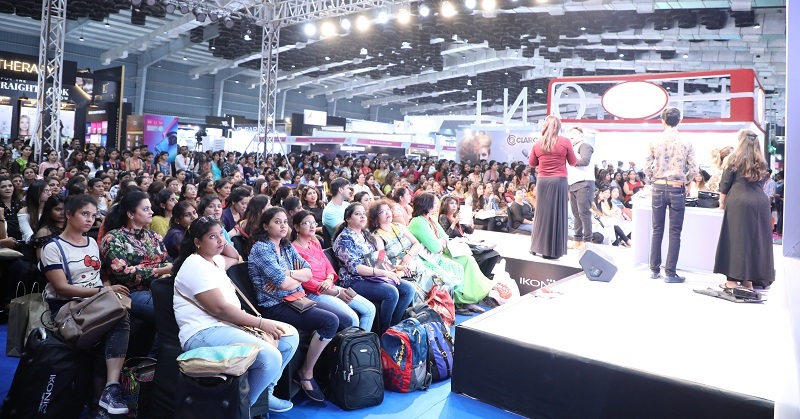 Seminars, live demos, panel talks, activities at brand booths – there was not a dull moment at Professional Beauty Mumbai. With beauty enthusiasts thronging the expo and exhibitors going all out in showcasing their brands, Professional Beauty’s Mumbai edition lived up to the expectations of being the best beauty and cosmetics show in South Asia. The Expo opened on 1st of October, 2018, at Bombay Exhibition Centre, Goregaon. The gates were due to open at 10 am for visitors and at 9 am, there was already a 500 long queue outside. The queue swelled into a crowd by the time gates opened. Exhibitors had worked overnight to set up their booths and they were ready and waiting for the crowd. As soon as the show opened, the ambience without Hall 4 underwent a drastic change. The air was charged with enthusiasm and there was excitement to be seen on all faces. Day 2 was no different as visitors continued to queue up and exhibitors matched the visitors’ passion with their enthusiasm. On closing day, on 2nd of October, the atmosphere at the Expo was as charged up as on the first day. Several booths had experts talking and demonstrating the latest products and techniques. You could see groups of visitors stationed at such booths, eagerly taking in the knowledge shared. From bridal make-up to creative hairdressing, brands were on top of their game in demonstrations. Key exhibitors like Beauty Palace had constructed different booths for their individual brands, e.g. title sponsor Ikonic had its own demo stage area, buying area and a separate section for Ikonic Luxure whilst brands like Cadiveu and Depot had their own specialist zones. All its stalls were teeming with customers as they sought to get best deals. 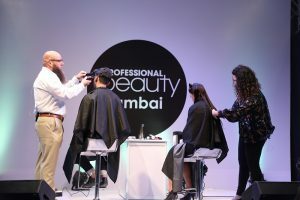 A few other brands that showcased educational demos included Offical Make-Up Partner Kryolan, UK hair tools company Dyson and the Vipul Chudasama Hair Studio. While hair and make-up were bestsellers, skincare was a category that was vying for attention. Professional Beauty Mumbai hosted a number of skincare brands that offered unique solutions to beauty professionals including a welcome back for US brand Pevonia. From variety in waxes to the raging trend of mask sheets, there was much to learn about skincare at the expo. The PB Demo Stage was choc-a-bloc with visitors focussing their mobile phones on the stage, trying to capture every bit of the action. In spite of the crowd, it was easy to navigate around the expo, thanks to the layout of the place. Each booth had expansive counter space, the aisles were wide and there was ample of space around live booths and demo stage. Professional Beauty had lined up an impressive list of educators for the third edition of Salon India. Seema Jerajani, Savio John Pereira, Nayana Karunaratne, Michel Balthazar and experts from Streax Professional and Olaplex wowed the audience. Working on different themes, the hair maestros conducted live hair cutting and styling on the Salon India stage. Each show culminated in a ramp walk. With beautiful models, gorgeous make-up and pulsing music, Salon India show was education and entertainment packaged together. Audience got to interact directly with the educators and learn techniques, tips and tricks from veterans. In its third edition, the Salon Management Congress powered by Zenoti was met with unmitigated enthusiasm from the industry. The event had a full house and an impressive line-up of speakers who discussed some of the burning issues of salon management. Topics such as staff retention and grooming, women empowerment, disaster management, finance, tech support, celebrity client management and many more were discussed and debated upon. Speakers included stalwarts like Adhuna Bhabani, Asha and Samir Hariharan, CK Kumaravel, Sunita Pawar, Sachin Kamat, Samir Srivastava, Rohit Dedhia, Vandana Bhardwaj, Vikram Bhatt, Pushkaraj Shenai, Vipul Chudasama and others. SMC opened newer avenues for salon owners and filled them up with aspiration to take their business to greater heights. Hall 5 at Professional Beauty was dedicated to a new segment – Cosmetic Ingredients and Packaging India show. In a bid to offer end-to-end solutions to the beauty industry, the organisers added CIPI to their repertoire. The show involved exhibitors showcasing ingredients for cosmetics, hair and skin products and packaging solutions. There was a Sensorial Lab wherein brands could conduct sampling sessions and a Packaging Clinic that involved knowledge dissemination on packaging solutions. The highlight of the first edition of show was the CIPI Summit. Some of the topics covered at the Summit were FDA regulations, Certifications, Creating Essential Luxuries, Bar Codes, Contract Manufacturing, Packaging and many more. Some of the key speakers included Kajal Anand of Debon Herbals, Nikunj Harlalka of CH Herbals, Akhilesh Prasad of Procreate Branding, Anjali Katariya of Reve Pharma, Renuka Thergaonkar of R&D Global Consultants, Sheela Iyer of FourthWave Media Group and Subrato Dey of GSI India. The Summit had a full house and the debut show of CIPI was wholeheartedly applauded by the industry who look forward to the next edition with much eagerness. Being the largest show ever seen in South Asia and visitors and exhibitors wowed. it would be fair to call Professional Beauty Mumbai a grand show. The electrifying enthusiam with which people participated in it is an indication of how our industry is progressing and the passion that drives it.